Diving at night or nightdiving as it is called, is one of the most exciting things one can do underwater, or even when snorkelling or free diving. Because the blue daylight is no longer there, colours become more vivid in the light of the diver's torch. 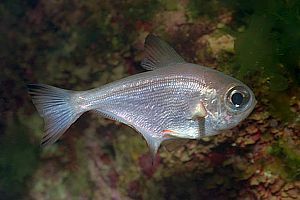 Fish sleep and become more approachable, while an entirely new guild, that of the nocturnal animals, the night shift, comes out in the open. The Poor Knights with its capricious sea scapes provide some of the world's most spectacular opportunities for doing a night dive. What is required for a night dive? what makes a night dive safe and enjoyable? What are the best spots for night diving? Where to dive and what to see. The night shift: the animals that sleep and those that come out in the open. Tips for photographers: the night is full of bugs that cause 'scatter'. What to do to avoid it? 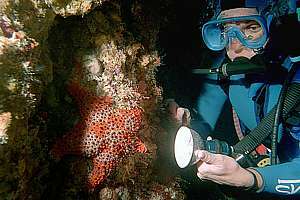 The diver's torch: most water tight torches are not very suited for night diving. What to demand and why? What is required for a night dive? Why is not every spot at the Poor Knights suitable for night diving? Let's face it, diving by night adds new difficulties like being disorientated, not being able to see far, either under water or above, losing sight of the charter boat, becoming separated from the buddy, not being at ease because of fear for the unknown and for what one cannot see, not being able to read the gauges easily, and so on. It follows that night diving is not as safe as day diving, and that it requires new skills. the boat should anchor safely and its anchor should not get stuck. In fact, leaving the boat in place after last day dive on the same spot, during which the anchor has been checked, is a good idea. Nightdiving from an unanchored boat is not a good idea. a simple lay of the land is desired: one can orientate easily along a wall or inside a channel, and not easily get lost. Divers must be able to decompress along a rock wall rather than the anchor chain, as the chain is usually difficult to find. a night dive is not a deep dive: deep diving adds a considerable amount of risk due to decompression stops and in case of emergency, help is difficult to provide. The people on board cannot see whether a problem has arisen. Everything is more difficult in darkness. a night dive is not a long dive: it usually takes between 30 and 50 minutes, and the dive time must be agreed upon, for people on board to detect an emergency soon. a night dive should have priority over meals: it is not a good idea to have a large meal first, which postpones the nightdive, while also many divers then choose not to do a dive, because the human body prepares for sleeping. Those who do the night dive then return to find the whole company asleep, unable to provide assistance with boarding, cameras and so on. 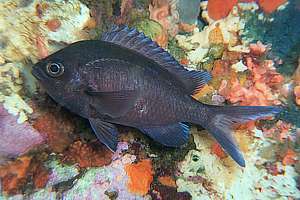 Preferably, the meal comes after the night dive. Remember that photographers need to take care of their equipment, and this must be allowed for. In case the meal is had first, make sure there are people on watch as boarding is usually tricky in the dark. divers must have good torches: when each diver has a torch, one serves as emergency for the other. See chapter below. no extreme currents or waves: currents and waves can be very bothersome at night, and rightout dangerous for people and equipment. use of a compass: a compass is a necessary piece of equipment for orientating at night, but if you are not familiar with it, don't bother, as you cannot learn how to use it and also do a night dive at the same time. Read direction from the environmental clues instead: the waving of the weeds, the ripples in the sand, the direction of the current, the slope of the bottom and so on. Having said all that, night diving does not need to be more stressful than day diving. For myself, it is just another dive, but a very enjoyable and productive one. The next chapter explains why. What are the best spots for nightdiving at the Poor Knights? Barren Arch: in conditions of calm at the east coast, Barren Arch is an ideal place for overnighting. With the boat stationary, and a day dive preceding the night dive, a good night dive can be had. But the lay of the land can be confusing at night. The northern cove, which is also the most shallow, is where the boat will anchor, and from here a good night dive can be had, even over the rocky bottom and along the walls there. The arch can not always be entered from the shallow side, and one needs to find it, going around the outside to the deep end, and back again, which takes precious time. 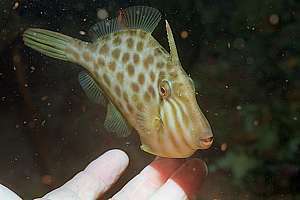 Rocklilly Bay: surprisingly, a good night dive can be had on its northern side which is sheltered from NE swell and storms. The beautiful rock life begins a little deeper than on the west coast, but between 10 and 15m a very colourful community can be found. Middle Arch: we give Northern Arch a miss because of its unpredictable currents and very deep bottom, but for experienced divers it can still be done in favourable conditions. By comparison, Middle Arch is much safer, and also more interesting for night diving as it has more habitats closer together. 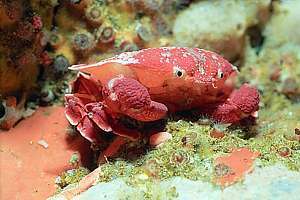 It is a very colourful dive with astounding sessile life in shallow water. Butterfish Cove and Maomao Arch: although the bottom is 40m deep, the walls are tranquil and rich in life. Watch out for currents in Maomao Arch. There are large boulders in the cove, tall seaweeds outside, and here and there a small cave. Skull Bay: a very sheltered bay which does not receive much sunlight during the day. 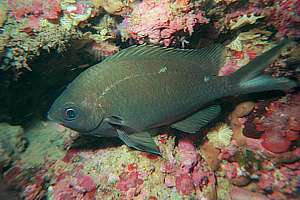 As a result, a reasonably good dive can be had in the kelp forest with sleeping fish, and along its steep but shallow walls. It is an entirely safe place. The Canyon: the boat anchors on a knoll, away from the shore and divers descend along this knoll, and into the narrow canyon. This dive is tricky because some divers have to find the anchor chain on their return. 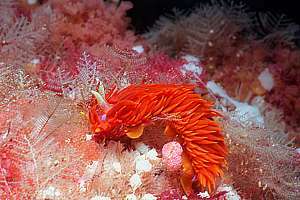 Dog-leg Channel: a safe and colourful night dive along the walls of the island. The sandy bottom is not deep. Nursery Cove and the Labyrinth: always astounding, although not colourful. A great variety of habitat and fish. A visit to The Labyrinth goes over sand, along a steep wall and through a small archway with colourful gorgonean fans and sponges. The Gardens: plenty of opportunity for shallow night dives, from El Torito Cave to Trev's Rock. Not colourful and not very varied either. Jan's Tunnel: an astounding night dive because of a jagged bottom contour with passages, and untold many sleeping fishes. Deeper down one also finds a colourful community. Ngaio Rock: like Jan's Tunnel but not very colourful. Blue Maomao Arch: one of the best night dives, both inside the very colourful archway and outside. 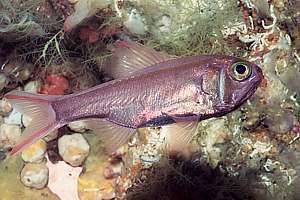 Most sessile life is found on its eastern entrance. My choice: 1. Middle Arch, 2. Blue Maomao Arch, 3. Nursery Cove and Labyrinth, 4. Rocklilly Bay. 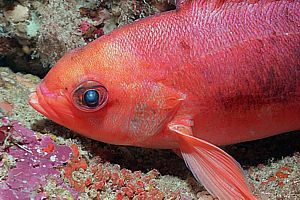 sleeping fish: one can see how fish sleep and how they change colour, sometimes being almost unrecognisable. But some sleeping fish hide so well that they cannot be found. 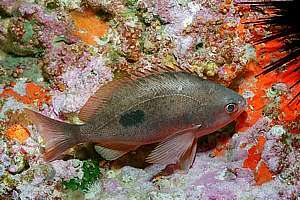 Wrasses like Sandager's wrasse for instance, burrow in coarse sand under overhangs, the dominant male last. Sleeping fish can often be approached easily, and at times even be handled. animals that come out only by night: many animals are nocturnal, hiding in deep crevices or under stones by day. During the night they suddenly appear, often oblivious to the diver's torch. Molluscs need their time and usually appear later in the evening. It thus pays to do late night dives now and then. colour: because the blue light is absent, the underwater world looks very colourful, almost too good to be true. 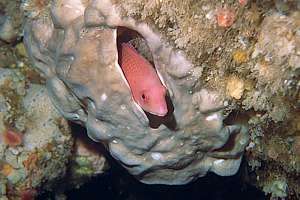 f028914: a scarlet wrasse (Pseudolabrus miles) has made himself a cozy bedroom inside a grey sponge. By rubbing the opening, it prevents the sponge from closing up. Notice the white margin of damage to the sponge. f041720: many fish don pyjamas at night, assuming colour patterns that are at odds with their daily colours. 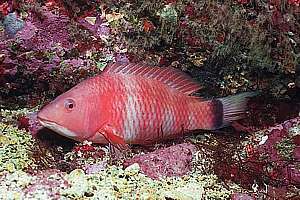 Here is a mature scarlet wrasse, now pink instead of red, and its white belly coloured the same as its back. f043321: pink maomao (Caprodon longimanus) don almost red pyjamas which change with age. This fish is very old. f048408: butterfly perches (Caesioperca lepidoptera) are light orange-pink by day but dark brown by night. f043314: this is a 5 cm baby leatherjacket (Parika scaber), woken up from its sleep and ill at rest. 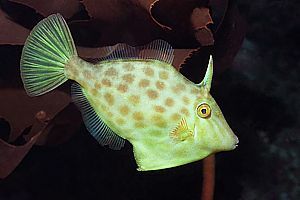 These fish sleep while biting on to a kelp leaf or other hold-fast. f043312: a young leatherjacket, blinded by the light and still ill at ease, allows itself to be handled. Notice the scatter caused by zoo plankton. f012535: a male two-spot demoiselle has turned its white spots off completely, assuming an almost black colour. f009816: this female two-spot demoiselle has become green-black, and has almost turned her white spots off. f048419: big-eyes (Pempheris adspersa) hide inside caves and crevices by day, to come out at night. With their sensitive eyes they are able to catch fast swimming bugs in the scant light of the moon. For this reason they are found in the shallows only. They never sleep. 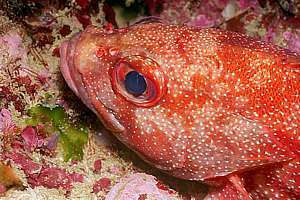 f041430: the slender roughy (Optivus elongatus) is like the big-eye a nocturnal planktivore, hunting and hiding in the same places as the big-eyes. f051403: toadstool groupers (Trachypoma macracanthus) belong in warmer subtropical waters. They hunt in the weak light of dawn and dusk. f036414: a triangle crab (Eurynolambrus australis) hides underneath boulders by day, but forages at night. f037905: the fire slug (Janolus ignis) comes out late in the evening. 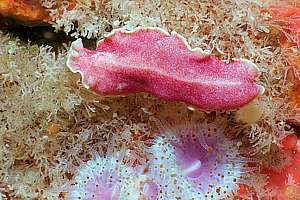 f051430: this unidentified flatworm comes out late in the evening. For underwater photographers, the night dive provides an inexhaustible supply of opportunities, but there is a problem. During the night, free swimming plankton organisms become attracted to the diver's torch or the photographer's 'modelling light' atop his strobe. This invites them right into the very area of the frame where backscatter is worst. Twice already I have had to abandon a night dive because of this. 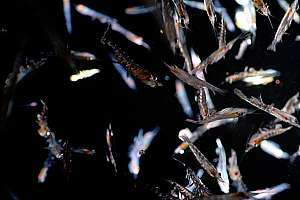 The kind of creatures causing this problem are many: tiny copepods buzzing around like golden fleas, swimming shrimps (krill) of various sizes and fast swimming bristle worms. dive early: begin your night dive earlier at dusk when your torch is not much brighter than ambient light. In this manner, the bugs don't notice your light as much. However, some night-shift creatures may find it too early to appear. dive a little deeper: most bugs are not found under the thermocline where the water clears up because it has less phytoplankton, which is also the food for your problem. night-dive in winter: after all the phytoplankton has been grazed and exhausted, the zooplankton also diminishes during the colder months of winter. move the modelling light and strobe back: move the light further away from the lens. This draws the bugs outside the scatter zone. time your photo with the wave wash: as the water movement temporarily washes the bugs away, it is the right time to click. move quickly: first point camera and lights away from the subject. Make all necessary adjustments and then turn around and move in on the subject before the bugs do. let the buddy do the lighting: this is by far the preferred way. Give your buddy the brightest of your torches and let him/her do the lighting from some distance away. This attracts bugs away from your subject. f045521: fast swimming shrimps like these can destroy your night dive. In fact, it was this night dive that I had to abort. There were sea lice too that kept biting my hands. f025019: a bright torch with flooding light is your best tool for night diving. The light shown here is 50 Watt, connected by cable to a 12V 6Ah battery pack on the dive tank. Most dive torches sold in dive shops are useless for nightdiving. Divers are sold little toys good enough for reading gauges by, and even for this they are inadequate. What you need is not a spot light that concentrates all light in a little spot, and then blinds your eyes, but a flood light of at least 20 degrees. Also the minimum light power is 10 Watt quartz-halogen. Being an underwater cinematographer, I have been spoilt rotten since my very first dives, by carrying a 50W (car head light strength) light source, connected by cable to a battery pack attached to the dive tank. I later perfected the techniques for making my own tiny but powerful dive lights (to be disclosed in the section on underwater photography). Do not use torches running on AA batteries, but buy one on DD batteries, or at least CC batteries. Check that the chromium reflector is pitted and that it casts a flood light rather than a spot light. The latest developments on bright white LED lights (Light Emitting Diodes), looks very promising, in which case AA batteries might just suffice. Remember that night diving is all about pleasure and amazement, and that an inadequate torch can spoil it all. Your most important night-dive tool is your torch! Don't skimp on it!